I traveled to Paso Robles in late April for the annual Hospice du Rhône (HdR) event, and scheduled a few vineyard and winery visits for the day before the event started and the day after it ended. There were a number of people who joined in for some or all of the visits – Eric Anderson, Jay Selman, Brian Clark, Al Osterheld, Eric Lundblad, John Tomasso, Boyce Brannock, Bob Summers, Bennett Traub, Mike Ripley-Lotee, Charlie & Pat Chadwick, and Terry & Joan Hyde – quite a crowd! I collected suggestions for visits from some of the group beforehand, and managed to make arrangements at a number of the places they were interested in checking out – though I saved a couple for next year too! I was able to make it to Paso Robles a couple of days earlier than I did last year, so I was able to attend Augie Hug’s traditional pre-HdR “Pinot Pirates” dinner at Villa Creek on Wednesday evening. I had missed this dinner last year and was glad to take part in it again. The food was delicious and paired nicely with all the Pinots on the table – my favorite courses were the “bacon & egg” bitter greens salad and the rabbit cassoulet. Nothing like getting ready for a weekend of Rhône wines with a great Pinot dinner! I’d arranged four winery visits for the next day – an ambitious schedule – so we had to get an early start, and we all made the drive a few miles south of town for our 9am appointment. ’09 Picpoul Blanc, Paso Robles (tank sample): Very light color, ripe tangerine/citrus, zingy acidity along with fairly good weight in the mouth, with a crisp finish. ’08 “The Gap” Cuvée Blanc, Paso Robles: 60% Grenache Blanc, 40% Roussanne.Light straw color, citrus with some stone fruit notes, spice, and a touch of oak, richer mouthfeel but still good acidity, smooth finish. ’09 “The Gap” Cuvée Blanc, Paso Robles (tank sample w/ 5% Picpoul): About55% Grenache Blanc, 40% Roussanne, 5% Picpoul Blanc, with some barrel-fermentation. Similar in character to the ’08 bottling but with less apparent oak and showing a little less weight on the palate, more freshness on the finish. ’09 “The Gap” Cuvée Blanc, Paso Robles (tank sample w/ 20% Picpoul): Picpoul Blanc increased to about 20% in this sample.Prettier than the previous blend, more floral aromas, some tropical fruit notes, more crisp acidity in the mouth, and a clean finish. I preferred this to the 5% Picpoul version. Very nice blend, Jennifer & Terry – go for it! ’07 “The Hedge” Syrah, Paso Robles: 100% Syrah. Dark color, very aromatic, dark fruits, some lavender and grilled meat notes along with touches of vanilla/oak. A big-bodied, mouthfilling wine with some youthful tannins – this should develop very nicely with a few years of bottle age. ’08 “The Hedge” Syrah, Paso Robles: 100% Syrah, to be released around the end of this year. Very dark in the glass, and more closed on the nose than the ’07, black fruits, meaty, and more peppery than the ’07. Another big wine, showing a more grippy tannic finish than the ’07. ’07 “5 Blocks” Cuvée, Paso Robles: 62% Syrah, 19% Grenache, 13% Mourvèdre, 6% Cinsault.Slightly lighter color, and brighter fruit profile, showing some ripe red fruits along with black ones, with more herbal notes than the “Hedge.” Rich yet lively texture in the mouth, with medium-big tannins, nice. ’08 “5 Blocks” Cuvée, Paso Robles (barrel sample): Similar blend to the ’07. Not as aromatic as the ’07 at this point, showing some high-toned raspberry fruit, spice, and oak. Medium-bodied with a juicy character in the mouth and slightly tangy finish. ’07 “Skins” Grenache, Paso Robles: 90% Grenache,10% Syrah. Medium purple color, intense raspberry on the nose along with spice and some floral notes. Very pretty wine but with good structure and bright acidity, and medium-big tannins on the finish, very nice. We had no problem finding our first stop at Terry Hoage Vineyards, a mile or two north of Highway 46 and a little ways west of the 101 freeway. Everyone arrived right on time and we stopped in front of the closed gate along the road. Hmm…Terry didn’t mention a gate code to me…but we soon figured out how to get the gate open and drove up the hill to the winery building. We got out of our cars and said hello to Terry Hoage, who’d come out of the winery to greet us. We decided to take a look at the vineyard first, so most of us made a quick dash back to the cars to retrieve jackets before starting our trek. Terry, a tall and lanky guy with a sly sense of humor, was an All-American football player with the University of Georgia in the early ‘80s, and enjoyed a long and successful career in the NFL afterwards. As we made our way up the vineyard slope, Terry talked with us about the vineyard. Terry and his wife Jennifer bought the property on the Westside of Paso Robles in 2002 – it had previously been the Winchester Vineyard, though only a small portion had been planted at that time. Terry told us that it was planted mainly to Chapoutier and 174 clone Syrah. Terry referred to the Chapoutier Syrah clone several times during our visit, though it’s better-known as Estrella clone – but it’s thought to originate from cuttings taken from Chapoutier’s vineyard in Hermitage. 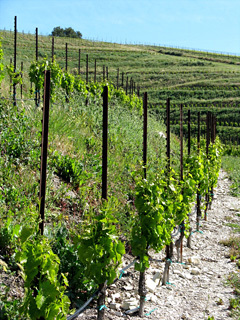 John Alban assisted with new plantings at the vineyard in 2003, with more Chapoutier clone Syrah near the winery building. Justin Smith helped plan further plantings over the next couple of years. Terry told us that the vineyard is now all farmed organically, with about 17 acres planted out of 26 total acres on the property. It’s planted entirely to Rhône varieties – Syrah, Grenache, Mourvèdre, Counoise, Cinsault, Grenache Blanc, Picpoul Blanc, and Roussanne. Soil is largely clay loam along with bits of limestone, which is typical for the area. Terry noted that it is high in pH and it retains moisture well, so that the vines don’t generally need too much supplemental water during the growing season. A distinguishing feature of the vineyard was the ground cover. While many vineyards have some ground cover between vine rows these days, I’d never seen anything like this. The growth was everywhere, and quite tall in many areas – in some places appearing to swallow up the vines themselves! Terry told us that the ground cover includes native grasses, legumes, clover, and vetch (which he noted makes great honey). He said that the tall ground cover has helped prevent frost problems, always a concern in the cool Templeton Gap area. He also mentioned that he has not had problems with undue competition for water and nutrients between the vines and cover crop. The vines are trained in a number of ways – we saw both unilateral and bilateral cordons on trellising, while other vines are head-trained. Terry noted that he may convert more of the vines to head-training in an effort to help shade the fruit, plus he noted this style also take less work to manage the canopy. Some of these head-trained vines are in the “gobelet” style – so named because the vine shape resembles a goblet. It’s an ancient way to train grapevines, dating back at least as far as the Romans. Terry told us that as his vines have matured, they are becoming more self-regulating and require less work in the vineyard. Finally reaching the top of the hillside, we came to Terry’s “meter-by-meter” Syrah block. Densely-planted (all spaced one meter apart), these vines are on their own roots rather than having been grafted onto other rootstock. This block looked amazingly different than on our last visit nearly five years before, when the area had been staked out but was otherwise pretty bare. Now, the tall cover crop was almost all we could see, though a closer look revealed the vines on their vertical cordons. We saw several other vineyards on this tour that have significantly denser planting than has been common in California. 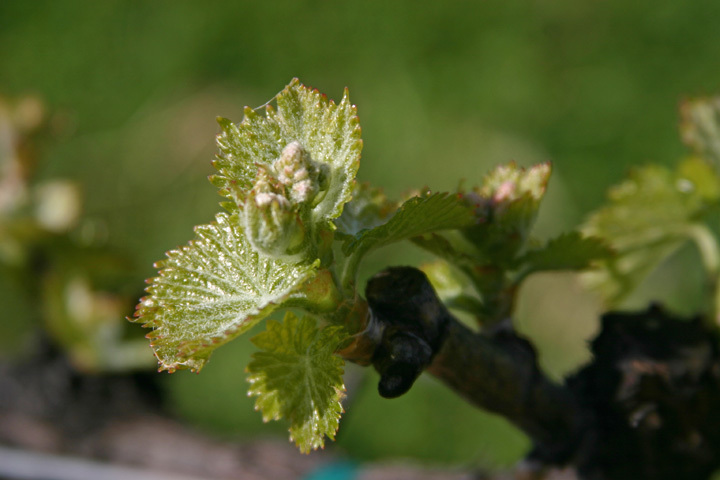 The theory is that the closely-spaced vines must compete more for nutrients and water, resulting in smaller berries and more concentrated flavors. This denser planting seems to be gaining popularity, as I’ve seen more vineyards up and down the state either replanting with tighter vine spacing or doing this with new plantings. Most of the fruit from the vineyard is used for the Terry Hoage label (they use all estate fruit for their own wines), though a little is sold to other producers – Saxum, Jacob Toft, and Hug buy fruit now or have purchased it in the past couple of years. As we walked back down the hill toward the winery, Terry pointed out where he’s planning to have a cave dug into the hillside in the future. For now, the barn-like winery building is fine for their annual production of a little over 2,000 cases. As we walked into the small tasting room, I recalled our previous visit once more and remarked to Terry that it looks much more like a real tasting room now that has an actual bar! The room is relatively small and simple, with some football memorabilia behind the bar being the only obvious clue to Terry’s background. Of course, there are the football-related names of the wines themselves too (in addition to the wines we tasted, they also make “Bam Bam” Rosé, “The Pick” Grenache Cuvée, and “The 46” Grenache-Syrah). As we began the tasting, Jennifer came in to greet us and to talk about some of the whites, as she is now in charge of the white wine program. We tasted an ’09 Picpoul Blanc from tank, and later tasted a couple of trial blends for the ’09 “The Gap” white. Terry used a graduated cylinder to measure different amounts of Picpoul to add to the blends to see what we thought of them – the composition of the final blend has not yet been decided. For the red wines, Terry told us that he uses whole berries for most of his fermentations, though Jennifer does foot-treading on some of the reds as well. Most lots go through fermentation with native yeast, though some lots are inoculated if needed. Terry primarily ferments in 1.5-ton bins, and pumpovers, punchdowns, and délestage are all utilized. Some lots get extended maceration prior to pressing. Terry told us that he decides when to press – as well as when to pick fruit – based on flavors rather than relying on the numbers. Has been aging wines in barrel a bit longer recently too. 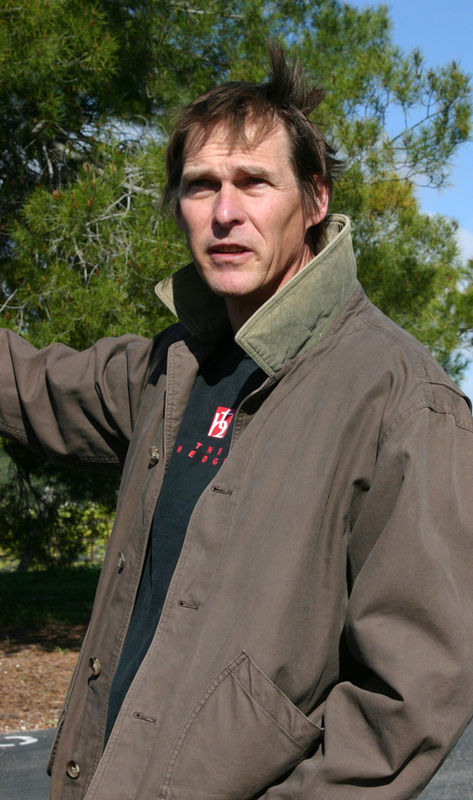 The first vintage of Terry Hoage wines, in ’02, was made by Justin Smith, and Justin served as a consultant in ’03. But since 2004, Terry and Jennifer have been running the show themselves. As we were finishing up and getting ready to leave, Terry and Jennifer mentioned that the design of the wine labels will be changing soon. The new labels will retain the distinctive “th” logo, but will no longer say “Terry Hoage” – this is being done to avoid issues with Hogue Cellars in Washington. Hoage in California…Hogue in Washington…doesn’t seem like there should be any confusion, but then I’m not a trademark attorney. The Terry Hoage wines are undoubtedly big, but there’s a sense of restraint about them as well. Most have an acidic backbone that balances the higher alcohol, and most have beautifully bright aromatics as well. As we tasted through the reds, it was interesting to compare how the wines share some basic similarity to those of Terry’s mentor Justin Smith, but also how Terry has diverged from that model to carve out his own distinct style. ’09 Grenache Blanc, Tierra Alta Vineyard, Santa Barbara County: First Grenache Blanc from Carina.Pale straw color, bright fresh apple aromas with a stony mineral touch, tingly acidity in the mouth, crisp, clean finish, delicious. ‘07 Grenache, Central Coast: Mostly sourced from Camp 4 Vineyard in Santa Barbara County, around 20-30% whole-cluster fermentation. Medium purple color, earthy cherry with a big spice component, medium-bodied with a not too tannic finish. ‘07 “Clairvoyant,” Central Coast:55% Syrah, 33% Grenache, 12%Mourvèdre, mostly from Santa Barbara County.Medium-dark color, black pepper is very apparent on the nose, along with ripe plum, spice, and a touch of oak. Nice texture in the mouth and a lively finish. ‘07 “Sibylline,” Central Coast: 55% Mourvèdre, 33% Grenache, 12%Syrah, mostly Paso Robles area fruit. The blend is a flip side of the “Clairvoyant,” with Mourvèdre taking the leading role here. Slightly darker color, with the aromas showing Mourvèdre’s earthy, leathery side. Plum and black cherry fruit is underneath, and the mouthfeel is fairly rich, with moderate tannins on the finish. ‘06 Mourvèdre, Central Coast: Includes about 5% Syrah. Similar to the “Sibylline” with the “sauvage” Mourvèdre character on display. Some herbal, stem-like notes along with a white pepper element, somewhat bigger mouthfeel and richer finish. ‘07 “7 Percent,” Santa Barbara County: 93%Syrah (from Colson Canyon Vineyard), 7% Viognier. Very dark color, showing noticeable floral notes along with pepper, blackberry, and spicy oak overtones. Mouthfilling and rich, this also has some grippy tannins on the finish. Walking back to our cars from the Terry Hoage tasting room, we found that it was warming up nicely, and we started off to our next appointment. After fiddling with that tricky gate once more at the bottom of the drive, we formed a caravan and headed to the freeway and back to town, then turned west again until we came to Adelaida Road, soon reaching our next destination at Carina Cellars. We proceeded up the short drive and parked by the recently-built winery building. After briefly trying to figure out where the entrance was, we were greeted by the friendly winery dog, which escorted us into the building. Winemaker Ryan Saccomano met us inside, and wasted no time in getting us started with tasting some of Carina’s current releases. After a few moments, winery owner David Hardee appeared and joined Ryan behind the striking tasting bar, fashioned from a single large piece of wood. Carina has been a fixture in Santa Barbara County for a number of years, and I’ve stopped at the tasting room in Los Olivos that they share with Tensley Wines on several occasions. David, an attorney, businessman, and wine collector originally from North Carolina, launched Carina Cellars after meeting Joey Tensley in 2002. David named the winery after his sailboat. Carina started sourcing some fruit from Paso Robles in 2005. In early 2007, David purchased the 83-acre property along Adelaida Road and began planting the vineyard he named Rancho del Cielo. 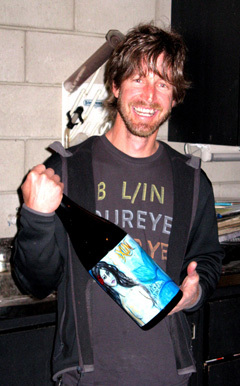 Ryan, who had worked with Joey Tensley on the Carina wines in Santa Barbara County, came north to Paso Robles when the new Carina production facility was completed there in December 2008. Joey remains the consulting winemaker for Carina, but naturally his involvement is not as day-to-day as it had been prior to the move. Carina produces quite a few wines – besides the ones we tasted, these include Viognier (including a late-harvest bottling), several single-vineyard Syrahs, Petite Sirah, Cabernet, and Zinfandel. Annual production is currently about 3,000 cases, and may ultimately go up to 5-6,000 cases. After our tasting, David invited us to take a closer look at the new vineyard, just up the hill from the winery. Leaving Ryan at the winery, we headed up the dirt road and stopped just outside David’s house, about halfway up the hillside vineyard. David told us that the planting was done in 2007, and that the vineyard is planted mainly to Rhône varieties, including Syrah, Grenache, Mourvèdre, and Viognier, a little Grenache Blanc and Tannat, as well as some Zinfandel and Cabernet Sauvignon (for the Carina “Iconoclast” bottling). We saw that the Grenache is head-pruned, as more and more new Grenache plantings in California seem to be these days. David told us that the Mourvèdre is at the highest vineyard section, the “Top Hat” block. The planting was coordinated by vineyard consultant Phil Stevens (he’s also done work for Denner and Starr Ranch), who also does the vineyard management. Prior to the vineyard, much of the property had been a walnut orchard. 23 acres are planted, and although some fruit was harvested last fall, 2010 will be first full harvest from new estate vineyard. As the vines mature, Carina will shift most of their fruit sources to the estate vineyard, although they still plan to buy some other fruit, notably Syrah from Colson Canyon. As we finished checking out the vineyard from outside David’s house, he asked us if we wanted to go all the way to the top. Sure, why not! He warned us that it’s a steep drive, but we noted we were all driving all-wheel drive vehicles, so we figured no problem. And it was no problem until we reached nearly the very top of the vineyard, where a couple of our cars had difficulty negotiating the final turn on the steep slope and slippery grass that covered much of the dirt track. Still, we all made it to the top. 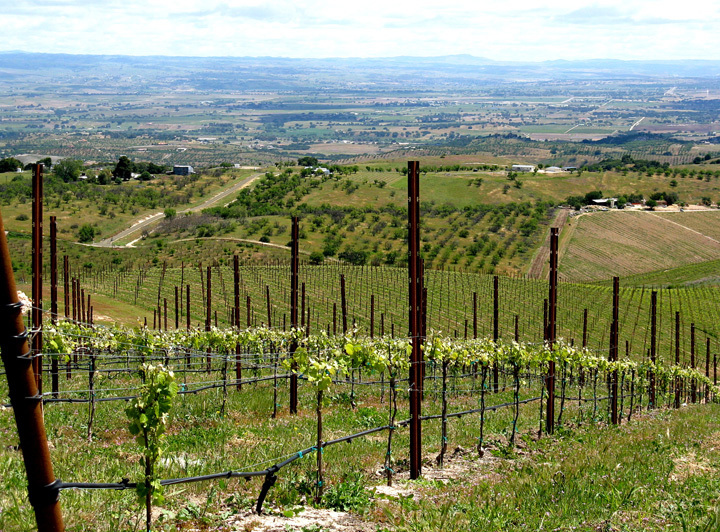 From that lofty spot, we could tell that the vineyard was named very appropriately – Rancho del Cielo meaning “ranch of the sky.” The views are expansive, taking in miles of landscape around Paso Robles itself and far to the east. There’s an impressive 500-foot elevation change from the base of the vineyard to the top. 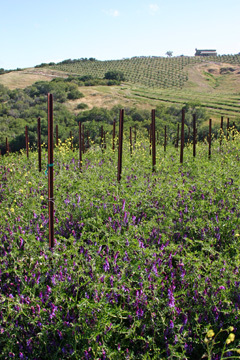 David believes that the highest spot, about 1,925 feet above sea level, may be the highest elevation vineyard in the coastal part of California. Carina’s current releases reflect their Santa Barbara fruit origins, and it will be interesting to see how the wines may change once the fruit from Rancho del Cielo forms the basis for most of the wines in the coming years. But because the Carina wines have tended to be fairly fruit-forward in style – not as big and lush as some Paso wines, but not radically different either – I wouldn’t expect to see any major changes over the next few years. The new vineyard should produce some fine fruit, so I think there’s considerable promise for the future. After leaving Carina, we headed back to Highway 46 and stopped for lunch at Farmstand 46, a short distance east of Vineyard Drive, and adjacent to the Four Vines tasting room. I’d heard a lot of good things about the place, and judging by the number of wine personalities we spotted there – Pax Mahle, Duncan Arnot Meyers, Stephy Terrizzi and her kids, Cris Cherry, Eric Jensen, Scott Hawley – it was clearly the place to be. The sandwiches were indeed delicious, although the service could have been better on this occasion – the food was not prepared in the same order as orders were taken, and this led to lengthy waits for some in our group. Still, I’d go there again, especially since the location is so convenient when touring Westside Paso wineries. ’07 Austin Hope Rosé, Hope Family Vineyard, Paso Robles: A saignée of mostly Syrah and Grenache, barrel-fermented with 60% new oak. Light salmon color, showing red fruits with an overlay of oak/spice on the nose, a bigger style of Rosé with a smooth mouthfeel and finish. ‘96 Treana White, Central Coast: 57% Marsanne, 43% Viognier.Medium yellow color, with a honeyed, nutty character along with some oak notes, very rich in the mouth and smooth finish. Nice older Rhône-style white. ‘01 Treana White, Central Coast: 61% Viognier, 39% Marsanne.Slightly lighter yellow, and a bit brighter aromatics of stone fruits, honey, flowers, and mineral notes, viscous texture and rich yet still lively finish, this still tasted surprisingly fresh and is aging nicely. ‘07 Treana White, Central Coast: 53% Viognier, 47% Marsanne.Light yellow color, ripe yet restrained stone fruit aromas with floral overtones, a rich, full-bodied white that should benefit from some bottle age to tone things down. ’07 Austin Hope Grenache, Hope Family Vineyard, Paso Robles: 100% new oak.Medium color, showing bright red fruits and spice with oak overtones, good structure and a moderate tannins on the finish. NV Candor Zinfandel, “Lot 2,” California: From ’07 and ’08 vintages of Zin from Paso Robles and Lodi. Medium color, somewhat jammy berry fruits along with lots of spice and a root beer note. The aromas reminded me of American oak but we were told that almost none was used on this wine. Medium-bodied with moderate tannins. NV Candor Merlot, “Lot 2,” Central Coast: From ’07 and ’08 vintages of Merlot from Paso Robles and Santa Barbara County. Medium-dark color, plums, black cherries, spice, and oak. Lively mouthfeel with fairly good structure, a straightforward Merlot. ’00 Austin Hope Syrah, Hope Family Vineyard, Paso Robles: The Syrahs have about 50% new oak. Dark color, still showing lots of ripe dark fruits, along with dried herbs, spice, and a somewhat woody oak character. Rich mouthfeel with tannins that still need more time to resolve. ’01 Austin Hope Syrah, Hope Family Vineyard, Paso Robles: Showing a little more age in the color than the ’00 (maybe a slightly oxidized bottle? ), this showed more pepper and herbs than the ’00, though the oak did not stand out as much. A big wine and still quite tannic. ’05 Austin Hope Syrah, Hope Family Vineyard, Paso Robles: Darker purple color, displaying riper blackberry fruit with a big spice component, a touch of mocha, and sweet oak. Seeming to be a bit more in balance right now than the previous two wines, the lush fruit helping to offset the grippy tannins. ‘07 Treana Red, Paso Robles: 70% Cabernet Sauvignon, 30% Syrah.Dark color, with ripe dark fruits and vanilla/oak overtones, Big, bold, and spicy, this is a youngster that will need some bottle age to show its best. Following our lunch, we drove a short distance east along Highway 46 and proceeded to Live Oak Road. There we met at the Hope Family Wines tasting room with winemaker Jason Diefenderfer and Direct Sales & Marketing Manager Whitney Hrdlicka. Jason has worked for the Hope family for many years, and since 1997 he’s been working at the winery itself. Hope Family Wines includes a number of labels: Austin Hope, Treana, Liberty School, and Candor. Austin Hope, who heads up the whole enterprise, was on the road when we visited, but Jason and Whitney were informative and engaging hosts. Austin Hope comes from a farming family, and he began working in his family’s vineyards when he was only eight years old. The Hope family started growing wine grapes on their property in Paso Robles in 1978, starting with Cabernet. Some of the fruit eventually went to the Wagner family (of Caymus fame) for the Liberty School label, and after working with Chuck Wagner, Austin become the Liberty School winemaker in 1995. The following year the label became part of Hope Family Wines. In 2000, Austin replanted the Hope Family Vineyard. The vineyard is now planted mostly to Syrah (five clones), Grenache (three clones), and Mourvèdre, along with some Roussanne and Bordeaux varieties. Most of the planting is high-density, on 5x5 spacing, and there are five acres on 3x6 spacing with vertical cordons. The goal of replanting with a higher vine density was to help lower the yield of each vine, concentrating the flavors into smaller berries. There are currently about 42 acres planted on the property, out of 67 total acres. Like many other vineyards in the area, the soil is mostly clay loam along with rocky, calcareous soil. Hope Family Vineyard is SIP-certified – the SIP (Sustainability In Practice) program among Central Coast vineyards seems to be gaining traction. Treana White was meant to be a Marsanne-Roussanne blend, but it turned out that the “Roussanne” was in fact Viognier – a vine identification mix-up that caught many California growers and wineries by surprise a decade ago. But in the end, the Marsanne-Viognier blend was a success, so they have kept it up. The older vintages we tasted show that California Viognier can indeed age well, at least in a blend such as this. The fruit for this wine comes from Mer Soleil Vineyard in Santa Lucia Highlands. The Austin Hope wines are made to showcase fruit from the Hope Family Vineyard. The Candor wines are not vintage-dated, blending both vintages and appellations, and are made to sell for less than $20. The lot number on the labels designates the specific bottling – the ones we tasted were “Lot 2”. Annual production is around 1,000 cases for Austin Hope, 5,000 for Treana, and 8,000 for Candor. A fourth label, Liberty School – which we did not taste – is a value-priced line with a much higher production level. In addition to the wines that we tasted, Austin Hope also produces a late-harvest Roussanne on occasion. The only wines made under the Treana label are its red and white blends. Candor also produces a Rosé, which we did not taste. The various labels under the Hope Family Wines umbrella are clearly aiming for different segments of the wine-buying public. Overall the wines were good, though for my tastes I’d have preferred the level of oak to be toned down in many of them. But I thought the newer Austin Hope wines were quite tasty, and it was great to be able to taste the older vintages of the Treana White wines – some of the more interesting whites we tasted in our travels. ’07 “Heart Stone,” Paso Robles: About 67% Syrah, 33% Grenache & Mourvèdre, some stem inclusion. Dark color, ripe black fruits, spice, and sweet oak, rich mouthfeel, long smooth finish. ’06 “James Berry Vineyard – 32,” James Berry Vineyard, Paso Robles: 40% Syrah, 40% Grenache, 20% Mourvèdre, given extra barrel aging, 32 months total. Medium-dark color, very spicy and somewhat earthy blackberry, mocha, and some savory notes, very big and structured with grippy tannins. ’07 “James Berry Vineyard,” James Berry Vineyard, Paso Robles: 40% Grenache, 30% Syrah, 30% Mourvèdre – this is the “100-pointer.” Dark color, brighter fruit profile with ripe raspberry/blueberry fruit, herbs, a touch of anise, and black pepper. Lush mouthfeel but with lively acidity, very well-balanced and finishing with fairly big but refined tannins. Certainly very nice now, but as with all the Saxum current releases we tasted, this should settle down and improve with some bottle age. ’07 “Bone Rock,” James Berry Vineyard, Paso Robles: 82% Syrah, 13% Mourvèdre, 5% Grenache. Very dark color, rich and ripe black fruits, smoke, black pepper, and vanilla/oak, full-bodied with a smooth texture and big tannins on the finish. ’09 Grenache, “Rocket Block,” James Berry Vineyard, Paso Robles (barrel sample): Fermented in stainless steel and pressed to concrete tank, still finishing malolactic. Vibrant purple color, super-bright fresh raspberry with some pepper notes, juicy acidity and big structure, terrific. ’09 “James Berry Vineyard,” James Berry Vineyard, Paso Robles (barrel sample): Co-fermented Syrah, Grenache, and Mourvèdre, from new puncheon, finishing malolactic. Dark color, funky/earthy at first but blew off quickly, ripe plum and darker fruits, lively texture on the palate with a grippy finish. ’09 “Bone Rock,” James Berry Vineyard, Paso Robles (barrel sample from hilltop block): Both whole-cluster fermentation and destemmed with stems added back. Inky black color, stemmy/spicy nose with blackberry, huge fruit component in the mouth with an aggressively tannic finish, just a monster wine right now (and not in a bad way!). ’09 “Bone Rock,” James Berry Vineyard, Paso Robles (barrel sample from lower block): From all destemmed fruit. A bit lighter color, dark berries, coffee, spice, with a mineral component. The fruit seems brighter and a little less ripe than the hilltop block, with a long tasty finish that’s not as tannic. ’09 Syrah, James Berry Vineyard, Paso Robles (barrel sample): From the lower portion of the vineyard, toward the north end, on deeper clay soil, this will go into the “James Berry” bottling. Dark color, ripe dark fruits with mocha and fennel notes, bigger and weightier on the palate, tannins are big but not harsh. ’09 Syrah, Terry Hoage Vineyard, Paso Robles (barrel sample): From meter-by-meter planting, 100% whole-cluster, barrel-fermented, this will probably go into the “Broken Stones” bottling. Vibrant dark purple, very bright aromas of dark berries with a meaty/savory component and mineral element that runs through it all. Surprisingly no overtly stemmy notes. Big but very lively on the palate, great structure with chewy tannins. Our last stop on the day’s tour was at Saxum. Little needs to be said these days about Saxum and owner/winemaker Justin Smith. If his wines’ consistent high ratings from critics over the years didn’t win him enough fame, the perfect 100 point score received last fall from Robert Parker for Saxum’s 2007 “James Berry Vineyard” bottling made him a superstar. It’s the first 100-point score ever for a Paso-area winery, and only the third for a winery from the Central Coast (Alban and Sine Qua Non being the others). Happy to report that success hasn’t changed Justin though – he’s still the same hardworking, crazy, passionate, slightly goofy guy he’s been since I’ve known him, always a pleasure to visit. Justin launched Saxum in the early ‘00s after splitting with Matt Trevisan and the Linne Calodo label they’d started a few years before. The first Saxum wine was the 2000 “Bone Rock,” produced at Mat Garretson’s winery. In 2003, Justin completed the current Saxum winery, overlooking James Berry Vineyard. 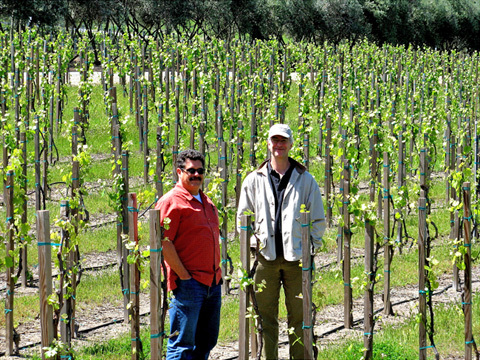 Justin’s father “Pebble” Smith planted the vineyard and its fruit has become much in demand. Justin and his wife Heather run the winery from their house adjacent to the production facility. Saxum’s small annual production of red Rhône blends, sourced from James Berry and other nearby vineyards, are tough to find unless you’re on their mailing list – and of course there’s a waiting list just to get on that. We all drove up the hill and parked near the house. As we waited a short time for Justin, who was finishing up with another group of visitors, we admired the stunning Bone Rock portion of the vineyard, right next to the winery and house. This area is planted along a series of curving terraces cascading down the steep hillside. The chalky, almost-white limestone soil was easy to see along the terraces. While the vines in the rest of the vineyard are trellised, the Bone Rock vines are trained on vertical cordons due to the difficulty of trellising along the tight curves. After a few minutes, Justin came over and welcomed us to the winery. We didn’t spend a lot of time chit-chatting with him – just about all of our group that day has known him for some time, and he was on a tight schedule, squeezing us in between meeting with a group of distributors and attending to some family duties with the kids. But we had no complaints as he handed each of us a wine glass and we started right in with some tasting, first of a few current releases, and then moving on to some barrel samples from the ’09 vintage. Justin did take the time to show us a special 3-liter bottle of the Saxum ’07 “Bone Rock” that he was donating for the HdR auction that Saturday. As we tasted, Justin told us a little about his winemaking. All the wines start out with native yeast fermentation, though Justin may inoculate some lots if they have trouble getting started. Different wines will get differing percentages of whole-cluster fermentation, and he noted that he’ll sometimes destem fruit and add back the stems into the fermentation vessel too. Justin mentioned that recent “Bone Rock” bottlings have included around 60-70% whole cluster, and receive extended barrel aging. Older “Bone Rock” wines tended to include much less whole cluster, around 10-15%. He told us that even with high percentages of whole cluster / stem inclusion, the pH of the wines is seldom a problem. Justin uses a variety of fermenters, mostly three, four, and five tons in size. A fairly new addition to the winery is a concrete tank. We tasted a sample that had gone straight to the concrete tank following fermentation, and it was very distinctive – very fresh and pure fruit flavors. The ’09 barrel samples were obviously extremely young, with some still finishing malolactic fermentation, but they were already showing very promising character. Of particular interest was tasting two samples sourced from the upper and lower sections of the Bone Rock portion of the vineyard – they were quite different from one another. Saxum’s wines are clearly in the forefront of the big, ripe style of red Rhône blends that Paso Robles has become known for in recent years. Although it’s not a style for everyone – it’s no secret that these wines can sometimes push the limits of ripeness – at their best, Saxum wines convey a hedonism in the glass that can be hard to resist. One aspect of the wines we tasted that struck me was how much they really deserve some time in the cellar. While their immediate appeal is apparent, there’s plenty of underlying complexity that should reveal itself more in time. A few of our touring group gathered for dinner that evening at Thomas Hill Organics, a fairly new restaurant in downtown Paso Robles. We were joined there by Brad Harrington of West Coast Wine Net and his wife Maureen, Linda Baehr of Peachy Canyon Winery, and Steve Anglim of Anglim Winery. The meal and the service were both excellent, and I’ll definitely be going back again. No visit to HdR can be considered complete without at least one late-night visit to the bar at Villa Creek. I headed over there after our Thursday dinner and the place was packed. Winemakers everywhere, everyone having a great time, it was unquestionably the place to be. A Friday night barbeque has become a tradition with some of us attending HdR – thankfully the weather cooperated this year and we didn’t have to resort to an “indoor barbeque” as we did last year. As always, there was way too much food and way too much wine, but who’s complaining? It’s a great time with great friends, and one of the top highlights of HdR weekend every year. ’09 Clesi Malvasia Bianca, San Bernabe Vineyard, Monterey County: Made mostly in stainless steel with a little neutral oak.Very light color, intensely aromatic, perfumed and floral, moderately rich mouthfeel with good acidity and a fresh, clean finish. ’07 Clesi Dolcetto, Nevarez Vineyard, Paso Robles: Light red-purple color, slightly floral notes along with black cherry and plum, medium-bodied with good structure, but just a touch of bitterness in the tannic finish. ’09 Giornata “il Campo” White, Central Coast:Blend of Chardonnay (from James Berry Vineyard) and Malvasia Bianca (fermented on its skins).Light color, very fresh and slightly floral apple/pear aromas with a touch of spice, medium-bodied with a long smooth finish. ’07 Giornata “Gemellaia,” Central Coast: 75% Sangiovese (from White Hawk Vineyard), 15% Merlot, 10% Petit Verdot (both from Margarita Vineyard). Vibrant color, black cherry, smoke, and dried herbs on the nose, loads of juicy acidity and moderate tannins. Went exceptionally well with the mini-lasagne appetizers. ’07 Giornata Nebbiolo, Luna Matta Vineyard, Paso Robles: From Nebbiolo clones 142 and 230. Medium-light red-purple color, bright and pretty aromas of rose petal and bing cherry, with a smoky/tarry note. Lively on the palate with a big, tannic finish. While not as unapproachable as a young Barolo, this is still a wine to lay down for at least a few years. ’09 Palmina Tocai Friulano, Honea Vineyard, Santa Ynez Valley: Made entirely in stainless steel.Light straw color, very pretty floral, citrus, and green apple notes along with a touch of minerality, fairly rich mouthfeel along with bright acidity, and a crisp finish. ’09 Palmina “Botasea” Rosato, Santa Barbara County: From Dolcetto, Nebbiolo, Sangiovese and Barbera. Light pink color, watermelon and spice on the nose with a subtle floral component. Smooth and refreshing on the palate. ’05 Palmina Nebbiolo, Santa Barbara County: From Stolpman and Sisquoc vineyards.Medium red-purple color, with floral and earthy notes plus ripe red fruits and a touch of oak, medium-bodied in the mouth, with a tannic finish that’s big but not harsh. Following the Saturday afternoon Hospice du Rhône Grand Tasting, Al, Eric Lundblad, and I drove a few miles south to Templeton for a tasting of Italian variety wines at the 15 degrees C Wine Shop & Bar. In just a few years, 15c – located next to a Trader Joe’s in a small shopping center off of Highway 101 – has become something of a destination, featuring a very good wine (and beer) shop, a wine bar with regular events, and fine food. And it doesn’t hurt that the place is run by two very lovely ladies, owner/sommelier Alison Rush Carscaden and manager Ana Jimenez Davis. This event featured Italian-style wines from Giornata Wines, Palmina Winery, and Clesi Wines, plus a few wines from Italy itself. On hand to pour their wines were Brian & Stephy Terrizzi of Giornata, Matt Duggan of Palmina, and Chris Ferrera & Adrienne Lindsay Ferrera of Clesi. Tasty appetizers from Ristorante il Cortile included a fennel, grapefruit, and shrimp salad, cherry tomatoes with fresh mozzarella and basil, marinated lamb skewers, and (mini-) lasagne. Steve & Chrystal Clifton of Palmina were traveling and Matt filled in admirably for them. I’ve been familiar with Palmina Winery for a number of years, and visited the winery and nearby Honea Vineyard in the fall of 2004 with Al and Eric Anderson. A group of us visited Brian & Stephy of Giornata at Luna Matta Vineyard and tasted a number of their wines there in the spring of 2009. Clesi Wines was a new label for me – they started out in 2004, and produce a Sangiovese, Barbera, and Cabernet in addition to the two wines we tasted at 15c. We ran into a number of people looking for a change of pace from the weekend of Rhône wines. We spotted Tom Hill, Bennett Traub – who was with Luna Matta Vineyard owners John Ahner & Jody McKellar – as well as Chris Brockway of Broc Cellars and Michael Roth of Demetria Estate, both fresh from pouring at the HdR Grand Tasting. Some fine Italian wines were poured at the event – NV Adami Prosecco Garbel, ’04 Casanova di Neri Brunello di Montalcino, and ’05 Vietti Barolo Castiglione – but I’ll focus the tasting notes on the three Central Coast producers who were highlighted at this event. This event was a pleasant diversion from our Rhône-soaked weekend. It showed me once again that there is indeed a place for wines made from Italian grape varieties in California. Both the whites and reds were very tasty, and I have particular hope for California Nebbiolo based on the two tasted at this event and others I’ve tried in the past couple of years. It would be nice to see more events like this one that highlight some of the best of Cal-Ital wines. ’08 “Kissin’ Cousins,” Paso Robles: 47% Viognier, 30% Grenache Blanc, 23% Roussanne, 100% barrel-fermented in puncheons, 30% new.Light yellow color, bright apple and white peach aromas with floral undertones, very smooth, creamy texture on the palate, moderate acidity and long smooth finish. ’06 “Azimuth,” Paso Robles: 51% Syrah, 19% Grenache, 14% Mourvèdre, 8% Tannat, 8% Alicante Bouschet.Medium-dark color, boysenberry and blueberry with some mocha notes, as well as a stony, mineral character. Big and rich but with good acidity and structure, and medium tannins on the finish, quite nice. ’07 “Azimuth,” Paso Robles: 53% Syrah, 35% Grenache, 12% Mourvèdre, May 2010 release. Slightly lighter color than the ’06 bottling, tending a bit more toward a red fruit profile, with plum and raspberry character along with lots of spice, pepper, and a similar mineral component as the ’06. Not quite as rich on the palate but very lively, and with a gripper tannic finish. Obviously just a baby, but this has the potential to be even better than the ’06 (which of course is still a youngster itself!). ’06 “Companion,” Paso Robles: 50% Cabernet Sauvignon, 30% Syrah, 10% Mourvèdre, 10% Tannat.Medium-dark color, the Cabernet component is dominant with black currant and herb aromas, more lush on the palate than the “Azimuth” with big but refined tannins on the finish. ’07 “Companion,” Paso Robles: 50% Cabernet Sauvignon, 50% Syrah.Will be released in summer or fall 2010. Dark color, less Cab-like on the nose, with a nice balance of plum, herbs, darker berry fruit, and mocha. Very rich mouthfeel and finishing with noticeably more chewy tannins. Cab-Syrah blends are not usually my favorites, but this was a nice one. ’07 Syrah, Paso Robles:100% Syrah, about 80% Estrella clone, 20% 877 clone.Dark color, very intense and complex aromatics of black fruits, smoke, pepper, cloves, and mocha. Full-bodied yet lively on the palate, nicely-structured with a big tannic finish, impressive now and should age well. Although many HdR attendees were getting an early start heading back home on the Sunday morning following the event, a few of us – Al, Eric Lundblad, John, Boyce, and I – drove back out to the Westside of Paso Robles along Highway 46 for a visit with Carl Bowker of Caliza Winery. Our group parked in the lot outside the tasting room along Anderson Road, and looked to see if anyone was around. We were about to walk toward the building when the tasting room door swung open, then closed again. We headed inside, where Carl greeted us from behind the tasting bar. We’d each seen the door open and close and wondered whether the other had done it – the legend of the Caliza ghost is born! Carl grew up in Hawaii, where his father was an irrigation specialist for local farms. He has a background in horticulture, and he’d previously owned a successful plant & floral business, which rented plants to trade shows and conventions. In late 2001, Carl and his wife Pam went to Tuscany on a wine-related tour. They found that they connected with the life that wine-producing families led there, and decided to leave the corporate life. Wanting to make Rhône variety wines, they looked for vineyard land and eventually found a beautiful spot in the Templeton Gap, which they purchased in 2003. Carl completed the Viticulture and Enology program at Napa Valley College in 2004, and was ready to start on the road to being a grape grower and winemaker. Carl credited a number of the local winemakers and growers with helping him learn the ropes as well – he mentioned Scott Hawley of Torrin Vineyard, Erich Russell of Rabbit Ridge, and Norm Benson of Dark Star as being especially helpful. We decided to tour the vineyard before coming back to taste some wines, and we started walking up the steep slope near the tasting room. Located adjacent to Booker Vineyard, with L’Aventure nearby as well, Caliza is located on prime property. Carl told us that Caliza is Spanish for “limestone,” and that’s appropriate for the area, noted for its fractured shale and limestone soil. There’s some clay loam soil too, mostly at the base of the hillsides. 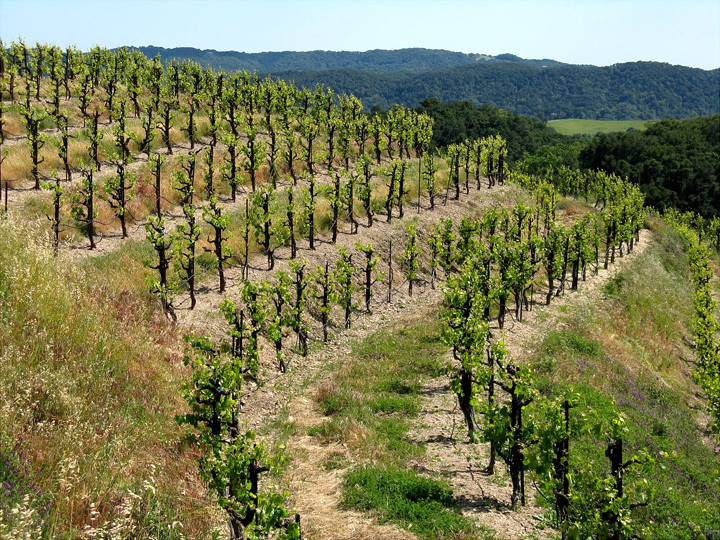 Carl noted that the vineyard soil has lower pH than many Paso vineyards – mostly in the 5.5-6.5 range. 20 acres are currently planted on the 60-acre property, and the elevation varies from 900-1,200 feet. There had been an old vineyard on part of the property when the Bowkers bought it, most of it planted to Zinfandel, Chardonnay, and Pinot Noir. 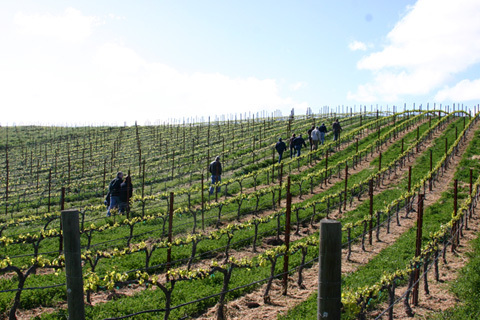 The old vineyard was pulled out and replanted in 2006 with new varieties and vine layout – about the only things remaining from the old layout are the terraced portions in some areas. Most of the vineyard is planted on south-facing slopes. 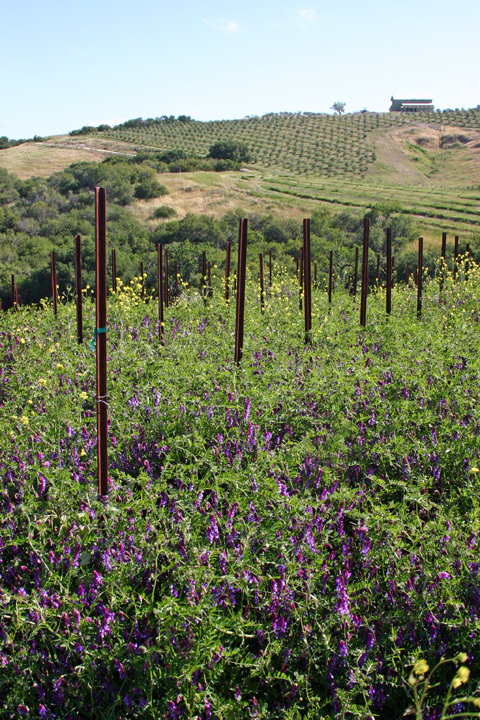 Most vine spacing is four feet, with a few areas at five feet, while there is denser three-foot planting on hilltop blocks. Vineyard Professional Services helped establish the new vineyard, and the Bowkers now manage it themselves. The vineyard is farmed sustainably, but is not organic. Current plantings include Syrah (six clones), Grenache, Mourvèdre, Petite Sirah, Primitivo, Tempranillo, Roussanne, and Viognier, and Carl told us that he’s thinking about adding Grenache Blanc, Picpoul Blanc, and Tannat in the future. Six different rootstocks are used, depending on the soil and grape variety. There’s a cover crop of clover and perennial grasses throughout. We walked past Grenache vines on the hill near the tasting room, trained in the gobelet style that we’d seen in other vineyards in the area. Farther up the hill is a block of Primitivo as well as some Syrah. After coming back down to the base of the hillside, we walked along and could clearly see the distinctly different-looking vines of the various grape varieties on the slopes above. Some estate fruit was harvested starting with the ’08 vintage. Caliza sources non-estate fruit mostly from other vineyards within a one-mile radius of their property – looking for vineyards that have a similar planting style, a south-facing hillside location, and are farmed by a winemaker. The Bowkers also source Cabernet from a separate property of theirs on Peachy Canyon Road, where their house is located. They plan to sell some of the fruit from the new estate vineyard over the next few years but they’ll see how things go – and as the vineyard matures they expect to use more and more of that fruit in their wines. Back in the tasting room, Carl started pouring us some of Caliza’s current releases, along with a couple of wines to be released in the coming months. The wines are currently made at the Booker winery next door, but Carl said they are planning to build own production facility. 2006 was their first vintage, and they’re making around 1,000 cases per year now. Carl expects the production will grow gradually but he doesn’t want to have it get too large. The winemaking is pretty straightforward. Most of the red wines see around 50% new oak, mainly using Meyrieux, Hermitage, and a few other coopers. We tasted through most of the Caliza line-up, with the exception of their sold-out Rosé. Their initial releases have been well-received. The “Azimuth” GSM blend is a wine that has generated some buzz. The blend for this wine will change from year to year, and may include other varieties in the future as well. Carl noted that “azimuth” can be defined as a point of deviation or change of direction, so he thought it was appropriate as a reference to the change in his and Pam’s lives that led them to this venture. Caliza looks to be another Westside Paso winery that could make a splash in the coming years. The wines are big and bold to be sure, but there’s a sense of refinement that makes them particularly appealing and already starts to set them apart. It will be interesting to see what direction their upcoming releases will take, especially once they start using more fruit from their own vineyard. They’ll certainly be worth keeping an eye on. ’09 Penman Springs Rosé, Paso Robles: A Rosé of Syrah, the fruit was picked specially for the Rosé and was lightly crushed and then pressed, not a saignée. Light salmon color, pretty aromatics of strawberry and spice, with a slight floral note. Lively and clean with a touch of tannin on the finish. ’08 James David Pinot Noir, Monterey County: Fruit is sourced from the San Lucas area, this sample from a once-used French oak barrel. Light purple color, herbal red fruits and spice, lighter-bodied in the mouth, with medium tannins. ’08 Penman Springs Merlot, Paso Robles: Larry noted this was sourced from a vineyard block using Smart-Dyson trellising. Medium-dark color, black cherry and cedar aromas with spicy undertones. Medium-bodied with nice structure and moderate tannins. ’07 Penman Springs Reserve Cabernet Sauvignon, Paso Robles: From a three-year old Minnesota oak barrel, this will probably have a little Petit Verdot added to the final blend. Medium-dark color, currant, cedar, and mocha on the nose, with hints of spice and tobacco, bigger on the palate than the Merlot with good balance and refined tannins on the finish, nice. ’08 Penman Springs Petite Sirah, Paso Robles: Very dark color, earthy plum and darker fruits, dried herbs, and chocolate. Dense mouthfeel and big chewy tannins. ’08 James David Syrah, Penman Springs Vineyard, Paso Robles: Medium-dark color, smoky plum and blueberry aromas, with some pepper and grilled meat notes, fairly full-bodied with medium tannins. ’06 James David Syrah, Central Coast: 53% Penman Springs Vineyard, 46% Cedar Lane Vineyard, 1% Eaglepoint Ranch (Larry noted the Eaglepoint component is from topping the barrels). Medium-dark reddish-purple color, white pepper, plums, and herbs on the nose, dense mouthfeel with more spice and earth notes coming through, along with some oak undertones, and a big, grippy tannic finish, could use some bottle age but should be quite nice. ’06 James David Syrah, Eaglepoint Ranch, Mendocino County: A bit darker purple color, smoky ripe blackberry fruit leads off, with touches of spice, mocha, and oak. Somewhat smoother with more refined tannins than the Central Coast bottling. This should be another good Syrah from Eaglepoint fruit. ’08 Penman Springs Port, Paso Robles: 67% Petite Sirah, 33% Petit Verdot, about 20% alcohol and 12% residual sugar. Ripe plum/prune, brown sugar, pepper, and chocolate, rich and dense in the mouth with the sweetness balancing out the tannins nicely on the finish. A tasty Port-style wine. After saying good-bye to Carl, our small group drove back to Highway 101 and then headed to Paso Robles Wine Services, the large custom crush facility just northeast of town. We met Larry Roberts outside the building, and we followed him in to taste some of the wines he’s making for Penman Springs and James David. 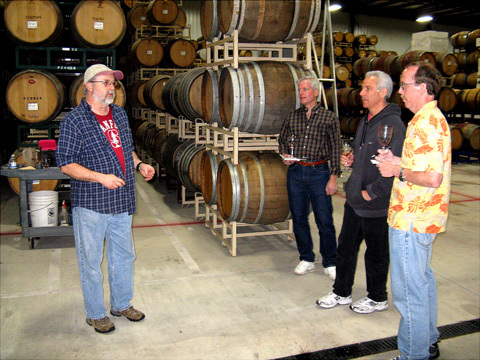 Larry has been around the Paso Robles wine scene for a long time, first making home wine there in 1980. He has a degree in graphic design, and he’s also a fine photographer – especially noted for photos of race cars and drivers. And he’s known to some as “Dr. Fermento” – a pen name he used in the past when writing a local newspaper wine column. His first wines were from an old vineyard that some friends owned on Peachy Canyon Road, where they grew Zinfandel and Alicante Bouschet. He continued making home wine with friends from the Cal Poly Graphics Department where he worked at the time. His first commercial wines were made for the Rio Seco label in the mid-‘90s, with a ’96 Cherry Vineyard Zin being particularly notable. Larry is now the winemaker for Penman Springs, where he started working in 1998. He also makes wine for Vista del Rey, as well as for James David (more on that label below). 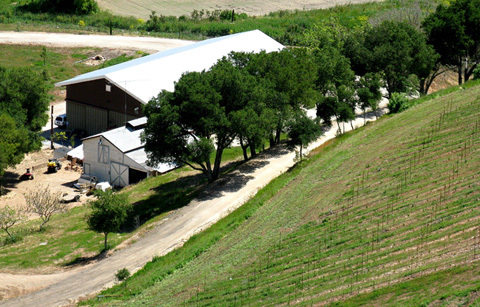 Penman Springs is located on the Eastside of Paso Robles, and their estate vineyard produces Cabernet Sauvignon, Merlot, Syrah, Petite Sirah, and Muscat Blanc. 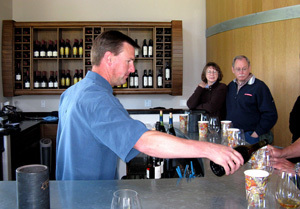 Larry made the wines at their own facility up until 2003, when the production was moved to Paso Robles Wine Services. With more up-to-date equipment available there, Larry is now able to do some things he wasn’t able to do as easily at their old facility, such as longer cold soaks and more extended macerations. In 1999, Larry started his own label, Caernarvon Cellars. 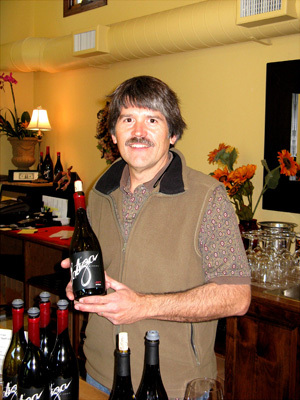 The name changed to Redline with the ’04 vintage, and has now gone through another transformation, with the wines becoming part of the James David Cellars brand. Owned by David and Kathleen Cole (David’s uncle is Penman Springs owner Carl McCasland), James David is the label that Larry’s wines from his later Redline days are being bottled under. 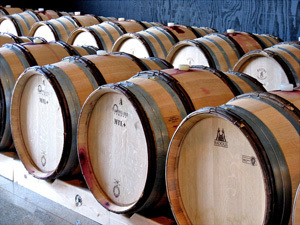 His ’05 Syrahs – in barrel for about 3½ years before bottling – are part of their current line-up, and he expects that the ’06 Syrahs will be bottled soon. 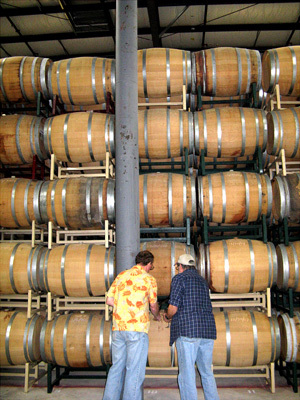 Larry continues making new wines for James David, and we tasted a couple of those barrel samples. Most lots that Larry makes are tank-fermented, where he feels he is better able to control the fermentations. A variety of barrels are used for aging, including some Hungarian oak and a good deal of three-year air-dried Minnesota oak – the barrel samples we tasted certainly did not have the usual “American oak” character to them. Most wines see around 30% new oak, with more for the Penman Springs reserve wines. 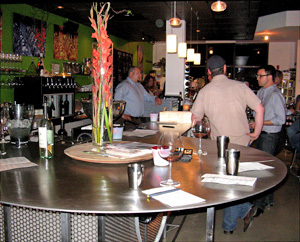 Among the wines Penman Springs makes are Cabernet Sauvignon, Merlot, a Meritage blend, Syrah, Petite Sirah, dry Muscat, and a couple of dessert wines. Larry had chosen a number of barrel samples he wanted us to try, but found that the barrels had been moved a bit since the last time he’d been there – apparently not an unusual occurrence at large custom crush facilities. Remarkably, even with the barrels stacked five high, he was able to find the ones he was looking for close to floor level. We tasted a good cross-section of wines from both Penman Springs and James David labels. Tasting through barrels with Larry is always fun. He’s had his ups and downs with his own labels, but his wines have been solid throughout. Somehow, the Penman Springs wines always deliver more than I expect, and the Cab and Port we tasted were especially nice. It’s good to see Larry get his ’05 Syrahs out under the James David label, and hopefully the ‘06s won’t be in barrel too much longer before they hit the market too. It should be interesting to see what the focus of the James David wines will be as the brand develops. ’09 “XOXO” Rosé, Central Coast:Medium pink color, aromas of watermelon and red fruits with a little spice, a bigger style of Rosé with a smooth mouthfeel and a subtle tannic bite on the finish. ‘07 “el Magnifico” Zinfandel, Paso Robles:From three barrels of Cushman Vineyard Zinfandel that received additional barrel aging, 30 months total. Medium-dark color, with ripe, spicy raspberry and boysenberry fruit. More restrained than many typical Paso Zins, not as big or jammy, medium-bodied and smooth on the palate, and not too tannic. ‘08 Cabernet Sauvignon, Booker Vineyard, Paso Robles: Inky dark color, intense plum/blueberry fruit with cedar, tobacco, and herb notes along with sweet oak undertones. Rich yet not heavy in the mouth, with big but refined tannins, very nice. ‘08 “Enorama,” Central Coast: Made for the Hug wine club in an Amarone style (the name is “Amarone” spelled backwards), this is a blend of Syrah, Grenache, Mourvèdre, and Pinot Noir, and fermented dry. Medium-dark color, very ripe red fruits on the nose along with loads of spice. Big but not dense on the palate, with very good structure and finish. I was surprised how much I liked this wine now that it’s in the bottle, more than I liked a barrel sample I tasted in January. John and Boyce needed to take off after our visit with Larry Roberts, but Al, Eric, and I made one more stop at Hug Cellars before driving home. 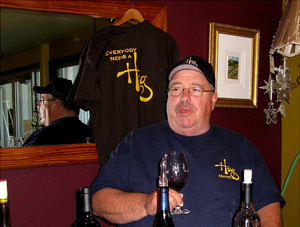 Augie Hug was behind the tasting bar, and had most of his current releases open. We’d tasted some of them at HdR, so we stuck to a few wines that Augie had not poured at the event. I’ve visited Hug Cellars many times over the years – most recently doing some barrel tasting there in January – so not much more needs to be said about them here. As with Paso Robles Wine Services, the winery is in a warehouse type of building, far removed from the bucolic scenery surrounding other wineries we visited on our travels. But since Augie doesn’t have his own vineyard – purchasing all his fruit from various growers – a place like this to produce the wine makes perfect sense. The new Hug releases continue the style that Augie has staked out over the years. Ripe yet well-structured, they have immediate appeal but most are really built to age. The “Enorama” Amarone-style wine is a fascinating experiment – maybe Augie will try something like this again. And the Booker Vineyard Cabernet is one of the tastiest Paso-area Cabs I can recall trying. Although the line-up of wines has been changing from mainly varietals and is now featuring more blends, the new wines have remained true to the Hug style. After saying good-bye to Augie, Al, Eric, and I grabbed a quick lunch at a local taqueria before starting our drives back to the Bay Area. Hospice du Rhône weekend is as much about seeing old friends, making new ones, sharing good food and wine, and visiting new places as it is about the seminars and tastings of the event itself. HdR weekend is the wine trip I look forward to more than any other each year, and this year’s trip once again lived up to expectations. As always, thanks to everyone that we visited for being so generous with their time and their wine!